A museum that, as the name suggests, tells the story of the presence of the Allied Forces in Berlin (and Germany) from the end of World War II up to the end of the Cold War. 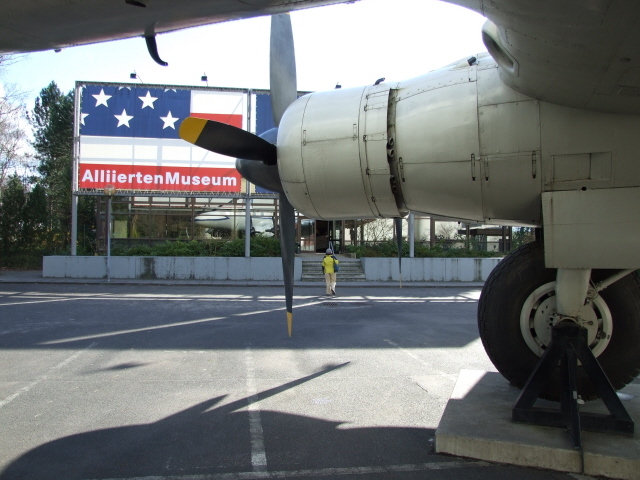 UPDATE May 2016: there are plans to relocate this museum to the old Tempelhof airport. A complete overhaul of the permanent exhibition is also to be expected. Funds for this have been granted in 2015. For how long the old museum will remain in place is currently unclear. If you intend to go and see it make sure to check ahead! For now it looks like it will remain at its original address at least until 2018 (going by the museum's calendar of events). More background info: From 1945 up to the end of the Cold War, Berlin had a special 'Four Power Status' and was accordingly divided into four sectors (just like Vienna was too, initially), one was allocated to each of the four victorious powers of WWII: the Soviet Union held the eastern part of the city, the USA the south, Britain the west, and France was given two districts in the north. The Soviet Zone of the similarly subdivided territory of Germany at large later became the GDR – and East Berlin its capital. Thus the remaining Western sectors of Berlin found themselves stranded as an island within the territory of the Eastern Bloc, the enemy during the Cold War. Because of Berlin's special status, no military presence of the newly armed West Germany was allowed, so the three Western Allies' armies remained the protectors of the city. How important they indeed were for the retention of Berlin's special status became quite clear soon after the end of WWII, namely when the Soviet Union started its Berlin Blockade from mid 1948, with the goal of forcing the West to give up Berlin. Instead, the Western Allies, now without access to the city by land, decided to fly in supplies to keep West Berlin alive. Thus one of the greatest air transportation operations in history began: the Berlin Airlift. It wasn't only food supplies that had to be flown in, but practically everything, even coal for use in the city's power stations. This required a large proportion of all available transport aircraft the Allies could muster. And quite some logistics too. The planes kept flying in three corridors, around the clock, landing at ever shorter intervals at Berlin's three airports. And they succeeded in keeping the city in just about sufficient supplies. Improving logistics and the use of better and bigger aircraft demonstrated that the West was able to keep the Airlift going. So after just under a year the Soviets gave in and ended the blockade. Thus the success of the Berlin Airlift could be regarded as the West's first "victory" in a "battle" of the Cold War. Another period of intense confrontation between the Western and Eastern Blocs on Berlin soil followed the beginning of the building of the Berlin Wall: at one point, American and Russian tanks even stood "nose to nose" at Checkpoint Charlie. However, the Western Allies did not attempt to actually intervene and stop the building of the Wall – the risk of a military intervention leading to World War Three must have seemed to great. Even at times of less heated confrontation, Berlin remained of prime interest to the West – obviously, control over an area of land right in the middle of the Eastern Bloc provided a listening post allowing for superb spying opportunities, which were indeed exploited liberally (cf. Teufelsberg). The premises of the current Allied Museum used to be part of the US Army barracks complex. 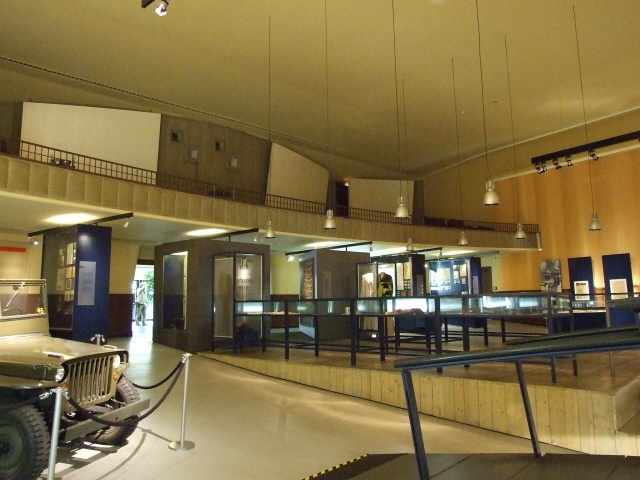 One building that is now part of the museum served as the US Army cinema "Outpost". The museum's approach is largely documentary, but also somewhat celebratory – but you probably have to make allowances for that, esp. in the section about the Berlin Airlift. Even though the museum covers the roles of all three Western Allies (and to small degree the fourth, Eastern Ally of WWII gets a mention as such an original ally too), but there's a certain emphasis on the American presence in Berlin – as would seem only natural, given the locale of the museum. Apart from the regular exhibitions there are also temporary exhibitions on various related themes (when I last visited there was an exhibition about Elvis Presley's time as a US soldier stationed in Germany – so there were lots of displays of typical 1950s tackiness too). 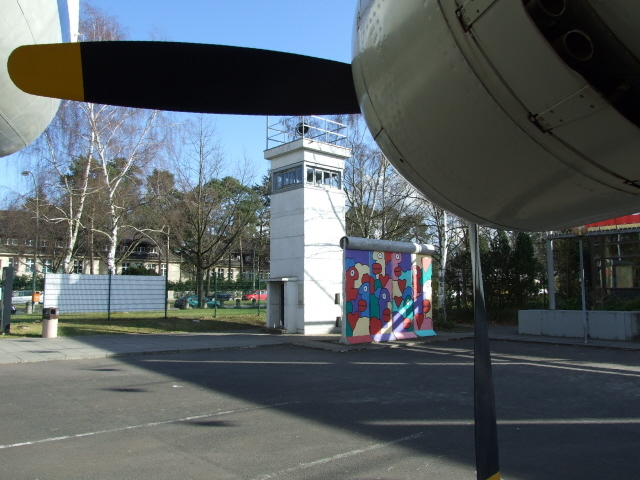 What there is to see: UPDATE 2016: it is planned to relocate this museum to Tempelhof, and the permanent exhibition will undergo a substantial overhaul and modernization. So the text below will at some point become outdated (but probably not before 2018)… and I will have to go back and check out its new incarnation when it has arrived. Watch this space. The museum is divided into three sections, two housed inside buildings and one open-air exhibition area in between the two. 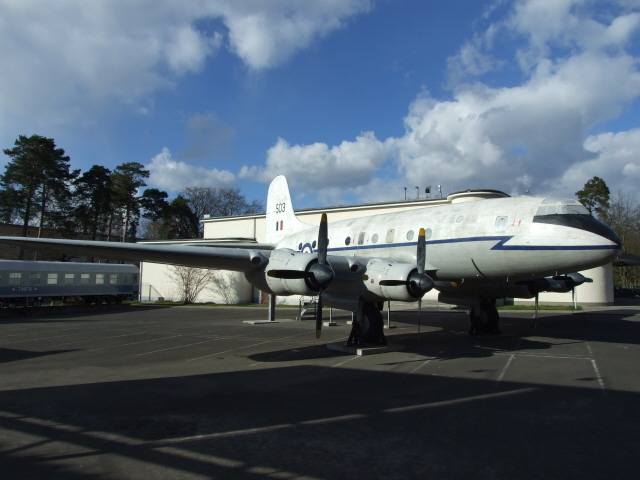 This area also contains the museum's largest exhibit: an original British "Hastings" aircraft as used in the Berlin Airlift (affectionately known in Berlin as "Rosinenbomber", literally 'raisin bombers', or 'candy bombers' as the Americans called them – this goes back to the bags of sweets on little parachutes that some pilots threw out of the aircraft’s windows as extra gifts for Berlin's children). 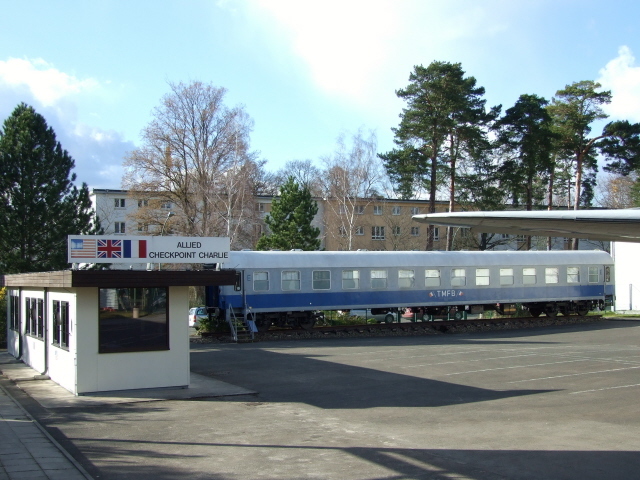 Other large exhibits include a railway carriage used by the French military, a colourful segment of the Berlin Wall plus a watchtower, both relocated here to form a Wall ensemble, and last but not least the original Western border control hut from Checkpoint Charlie (the one in front of the Museum Haus am Checkpoint Charlie is not real but a reconstructed copy!). 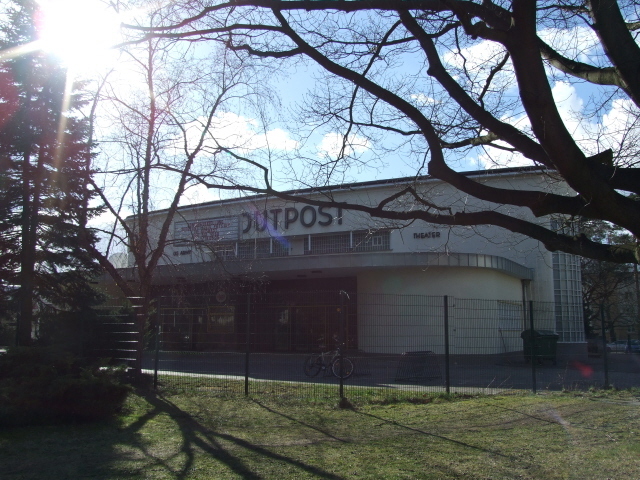 The exhibition in the former "Outpost" cinema focuses on the Berlin Airlift and also on the early years of occupation, aid and reconstruction. The exhibitions in the other building are dedicated to the East-West conflict of the Cold War from the 1950s, to the life of the foreign military in Berlin, and to their eventual departure in 1994, when Berlin's status finally changed as part of reunification, when Berlin became the capital of a once again sovereign Germany. The one exhibit that is likely to attract most attention is an original section of the spy tunnel which the Western Allies built under the Berlin Wall in order to tap Soviet military telephone lines. Thanks to a double agent, though, the Soviets had been fully aware that this spying mission was going on from the start. 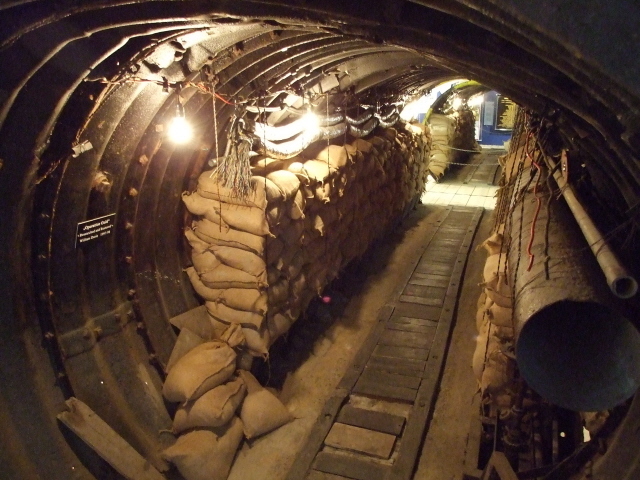 Still they staged a highly propagandistic "discovery" of the tunnel – photos of this are also on display at the Allied Museum. A particularly interesting aspect concerns the evolution and change in the Western propaganda, as evidenced in the displayed documents, posters and so forth. An early brochure, for instance, obviously from the early post-war period, and presumably distributed amongst Western (US) soldiers, is entitled "Our Red Army Ally". In contrast to that, later examples of American propaganda material on display are already fully in line with the full-on anti-communism of esp. the 1950s onwards. What in my view comes across a bit overblown is the celebratory sections about the roles of the US presidents Kennedy, Reagan and Bush senior. For instance, there seems to be the suggestion that Reagan's drama and pathos speech delivered in 1987 right in front of the Brandenburg Gate, in which he famously exclaimed "Mr Gorbachev, tear down this wall! ", actually did directly contribute to the Wall eventually coming down. Some American old-school conservatives may like to see it this way, but historically such a view is more than questionable. Location: in the south-west of Berlin, in the district of Dahlem, at Clayallee No. 135. Access and costs: a bit out, but quite easily reachable; (mostly) free. Details: It's a bit far out, but still not too difficult to reach by public transport. Just about easy walking distance (ca. 10 mins.) from the metro stop (line U3) "Oskar-Helene-Heim"; or get the (somewhat infrequent) bus 115 from the S-Bahn regional metro train station of Zehlendorf (S1) and get off at the dedicated stop "Alliiertenmuseum". Opening hours: daily, except Wednesdays, 10 a.m. to 6 p.m. Admission to the museum is free. The interior of the "Hastings" aircraft is accessible only on Sundays, and a small admission charge is levied (1 EUR). The other large open-air exhibits can only be seen from the inside on guided tours (35 EUR). Time required: You can easily spend an hour here, even more if you really read every text displayed and view all the videos in their entirety. On request, you can be shown a range of films in the conference room, each lasting between 17 and 60 minutes. There are also guided tours on offer (35 EUR), but they are hardly necessary for the normal individual visitor – everything is explained sufficiently by accompanying texts (in English – plus German and French) or is self-explanatory as such. Combinations with other dark destinations: in general, see Berlin – there's little else to be seen in the immediate environs of the museum, except a couple of memorials, esp. the "Wall Memorial" just south of the museum complex. However, if you've made it this far into the south-west of Berlin you might want to consider also visiting Teufelsberg (the former US spying Field Station) or carrying on even further south and adding on a visit to the House of the Wannsee Conference, which can be reached from the end of the line of the regional metro train line S1, four stops from S-Zehlendorf. Combinations with non-dark destinations: see Berlin – there are no touristy attractions near the museum, but not far from the museum's grounds you can get to the Berlin's expansive forest and recreational area of Grunewald (cf. platform 17 monument and Teufelsberg).